Getlink produced revenues of €1,033m in 2017, up 3.7% on a constant exchange rate basis or 0.9% in actual terms. Its Q4 revenues totalled €249.6m. Its Shuttle Service segment, which is the groups largest, produced €604.1m of its annual revenues. This was up 3.3% on a constant exchange rate basis. Railway Network revenues were 3.8% higher on the same basis at €292.8m. Getlink carried out marginally fewer truck shuttles in 2017, at approximately 1.64m. 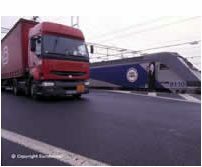 Rail freight tonnage carried by DB Schenker, SNCF, GB Railfreight and Getlink’s subsidiary Europorte, was up 17.1%. in the year. Europorte’s volume increase came from the automatable, chemicals and cereals sectors.